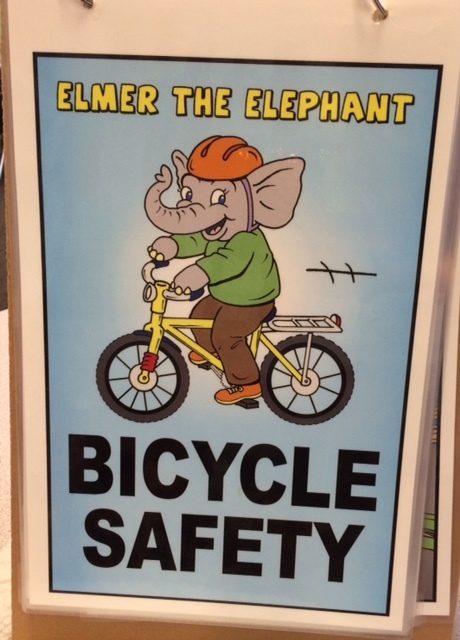 We had a fun visit from Elmer the Safety Elephant on Bicycle Safety. Thank you so very much to Mrs. Young from the North Shore Safety Council for coming to speak to us. With our mostly wonderful early summer weather, families are getting into the bike season and everyone needs to be safe. When shopping for a bike helmet, we need to ensure it fits safely. We see many people in our community wearing helmets. The children are very aware of this and were able to think of many times when they wear, or have seen, people in the community wear a helmet. This includes, but is not limited to, cyclists, hockey, football and baseball players, motorcycle riders, race car drivers, construction workers, skiers and skaters. We should wear a helmet in any activity where your head might get hurt or banged, such as scooters and pogo sticks. 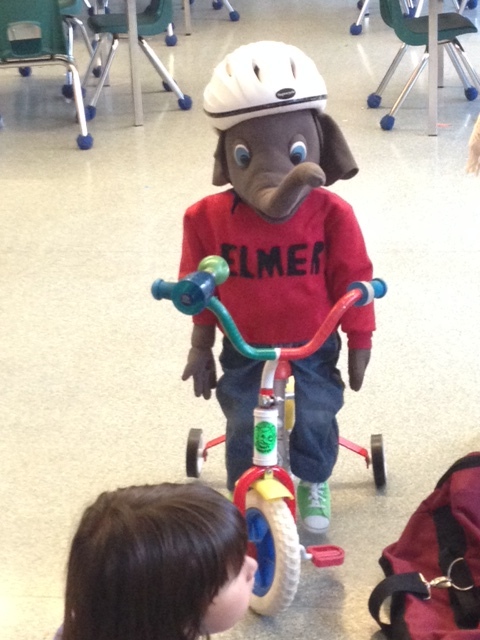 Mrs. Young explained that we don’t just wear a helmet: we have to wear a helmet correctly. 2 – cover your eyebrow with two fingers. The helmet should rest in the middle of your forehead. With your fingers, you would be able to feel the edge of your helmet on your top finger. It is very common to see many adults and children wearing their helmet too high up on their head. 4 – make a “V” with two fingers on each hand and place on either side of your head at your ears, with one finger on either side of your ear; that’s where your straps should be. 1 – you should be able to tuck one finger comfortably under your strap, so it’s not too loose. This strap is tricky so the children will need an adult to help adjust it. If you see someone when you are riding and you think there’s not enough room for you or for someone walking by, you may need to stop. We need to be respectful of others who are on the sidewalk, and practise safety. Stop when crossing a driveway in case a car is coming towards you, either backing out or driving in. Ride single file, making a line. Cyclists should be one behind the other to make room for the pedestrians. You need to slow down and be mindful that you are sharing the sidewalk. To cross a busy street, walk your bike across the street. Make eye contact with the driver first to be certain the vehicle has stopped before you enter the intersection. If you come to a busy area, or there are lots of cars or construction, stop and walk your bike. You are looking after yourself if you slow down and stay safe. You can’t make other people wear helmets But, you can wear yours and show others you are keeping your head safe. If you have a lot to carry, place your belongings in a backpack or a bike carrier so you can keep both hands on the handles. After a bike ride, you want to keep your bike safe. You can learn how to look after your bike by putting it away in the garage or other safe place to keep it dry. A wet bike, left out in the driveway, gets rusty. It was a week of fairy dust and magic this week in the Kindergarten. 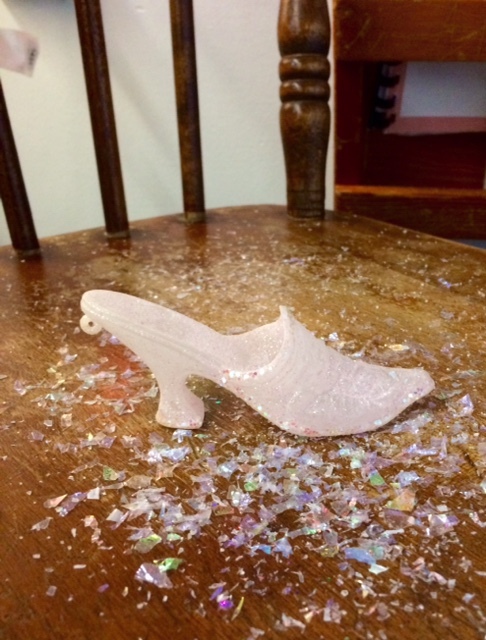 You’ve probably guessed that Cinderella’s back in town. We will be posting more on Cinderella in the next day or so. Next week we will read “Snow White.” “Snow White” will be the last fairy tale we will study in our theme study. We’ve had a wonderful time sharing so many different stories with the children, building upon their knowledge of the story and story structure with each new version and listening to them compare and contrast key elements of the stories. 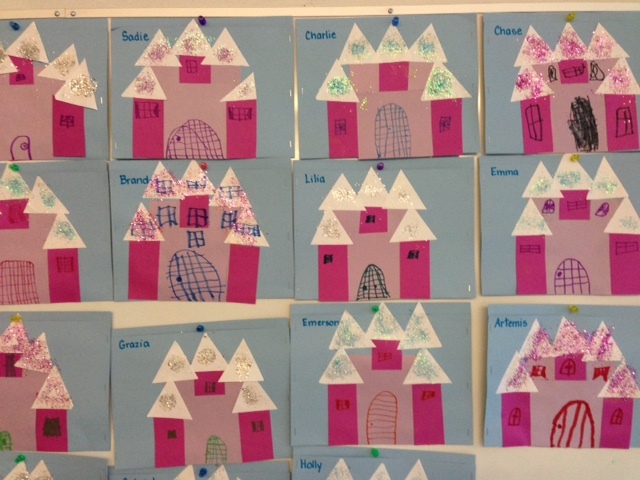 We created these beautiful castles for our fairy tales folders. This was a fun idea we found in an Usborne art book. We’re embarrassed to say we cannot find the original book among our resources. But what we essentially did was pre-cut rectangles and triangles (more integration with our Geometry Math unit) and glued them together into a castle with towers and turrets. Some felt pen details and a whole lot of glitter (fluffy Christmas sprinkles) turned these simple castles into something very special. We love to make special folders for the children’s classroom activities. We believe it honours the hardwork and diligence of these very tiny people by creating something beautiful, that they can be proud of to show their parents. 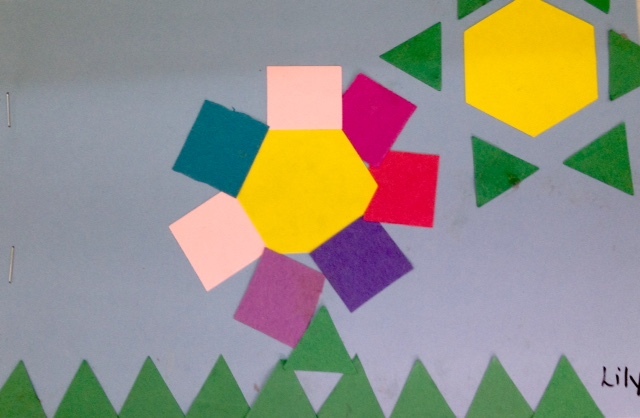 We also made these wonderful geometric creations for our Geometry Shape books. We gave each child a simple construction paper cover and some shapes we found in the school basement storage area (note to self: sort out that pile of stuff growing in the guest room at home). This was a lucky find as they are the pattern block shapes we use in class, with a few leftover squares thrown in as well. We have a very, very busy upcoming week with the Kindergarten. Tuesday, June 14: High Touch High Tech “Newton in a Nutshell” Scientist visit. Our children will participate in a variety of activities on Force and Motion, one of the Kindergarten Science curriculum components. Tuesday, June 14: West Vancouver Memorial Library Visit to talk about the Summer Reading Program and how your children can participate. Thursday, June 16: Primary Talent Show with Grades 1-3 students. Our children have been invited to the Primary Talent Show in the afternoon. We will be reviewing appropriate audience behaviour with our classes. Friday, June 17: Prince and Princess Day. Your child is welcome to dress-up if he or she wishes. Some of the children were concerned about what to wear, but we’ve explained that what they have at home for costumes will be fine. Princes, Knights or pirates would be fine attire for the boys, but please, no weapons. Girls may wear their princess gowns if they wish. This is optional so only if your child wants to participate. Friday, June 17: Kindergarten Cookie Sale. Our children have been extremely flexible and understanding about not participating in the myriad of bake sales and freezie sales this year. We’re reluctant to take part in every sale because of our healthy food philosophy, and the fact that the children could be standing in line for a long time during their playtime. There are many more years at Ridgeview for your child to purchase a treat. That being said, we voiced our concerns to Mr. Blackburn, our Vice-Principal, and he and the Grade 6 students have kindly offered to have a Kindergarten Cookie Sale just for us. The Grade 6 students will sell the cookies just prior to lunchtime on Friday. The final price has not yet been determined, but it will be $0.50 or $1.00 a cookie. Each child may purchase one cookie only. This entry was posted in Health and Wellness, Newsletter by thekinderteam. Bookmark the permalink.